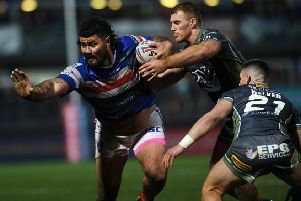 Wakefield Trinity Wildcats head coach James Webster has vowed that his team “won’t get ahead of ourselves” following a thumping 44-24 Super League win over Hull KR. Wildcats marked their first home outing of the new season in style and made it two wins from two thanks to hat-tricks from Chris Riley and Jacob Miller. Matty Ashurst and skipper Danny Kirmond also crossed, former Rover Craig Hall adding six conversions, to see off the Robins at the Rapid Solicitors Stadium. While Webster admitted he was “very happy” with the result, he also believed that his team still needed to improve. He said: “I thought we kept inviting them back into the game. The game was in the balance with 15 minutes to go but I honestly thought, if we had put our foot on the pedal from the start, we could have blown them away. “There is still a lot of improvement in us but we’ve got some players that can score us some points.